This composite image shows the distribution of dark matter, galaxies, and hot gas in the core of the merging galaxy cluster Abell 520. "False-colored" maps show the concentration of starlight, hot gas, and dark matter in the cluster. The blue-colored areas pinpoint the location of most of the mass in the cluster, which is dominated by dark matter. Dark matter is the elusive, invisible substance that appears to make up more than 80 percent of the total mass in the universe — far more than accounted for by the "regular" matter that makes up things like stars, planets and everything astronomers can directly observe. 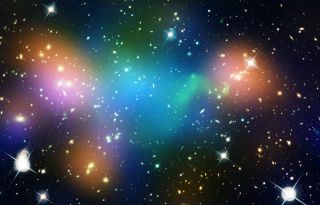 A new study makes the bold claim, however, that perhaps dark matter doesn't exist at all. But scientists aren't convinced that the study holds water. Hints of the existence of dark matter appeared as early as the 1930s, but the real discovery took place in 1978, when astrophysicist Vera Rubin concluded that the observable motions of galaxies couldn't be explained by the laws of Newtonian physics alone. Due to the speed of the galaxies' rotation, the stars on their edges would fly away if the only thing holding them in place were the visible matter. The hypothesis at the heart of the new theory s that "empty space is scale-invariant," Maeder, a researcher and honorary professor at the Department of Astronomy of the University of Geneva, told Space.com. "That means that if we make dilatation of [empty space] or contraction of it, its properties should not change, which seems rather reasonable." "When [scale invariance] is introduced into the equations, this leads to a new small force, which is opposed to gravitation. But this force only appears at very low densities," he said. On Earth, such a force would be a million or billion times smaller than the force of gravity, so it's not something that could be easily measured, he said. On the galactic scale, however, this force would be powerful enough to help hold the rotating galaxies together even without the presence of dark matter. But the scale invariance of space is not part of Albert Einstein's theory of general relativity, which introduced the concept of a universal fabric called space-time, and provides the most precise description of gravity available. Time after time, general relativity has stood up to new tests, and new observations have confirmed the theory. Rather than modifying that well-accepted theory, Maeder works with an alternative concept called the cotensor analysis, which, unlike general relativity, allows him to work with scale invariance. "There are many observations which would better fit with this theory," said Maeder. "I have about 10 positive observational facts, and this is satisfactory. But there is still more work to do to fully confirm that." Among those 10 items, which are cited in the new paper, Maeder said that his model provides an explanation for the rotation rate of individual galaxies, which has previously been attributed to dark matter. His model also fits with observations of the surprisingly high velocities of galaxies in galaxy clusters, he said. Scale invariance of empty space and the resulting effects, Maeder said, could also account for the accelerating expansion of the universe, which scientists can't yet explain. This acceleration is generally attributed to a mysterious effect called dark energy. However, other experts who talked with Space.com said they don't find Maeder's conclusions persuasive. "Any model that will replace general relativity will have to fit all of our observational cosmology data," said David Spergel, professor of astrophysics at Princeton University. And Maeder's hypothesis fails to explain some important observations as well as dark matter does, Spergel said. In particular, the "cleanest" evidence for the existence of dark matter, Spergel said, comes from the cosmic microwave background (CMB), a faint glow that fills the entire universe and can be observed in every direction. The CMB is cooled-down radiation that is left over from the very early universe, shortly after the Big Bang. According to Pat Scott, an astroparticle phenomenologist at Imperial College London, the temperature fluctuations observed in the cosmic microwave background can't be explained without the existence of dark matter. Maeder's ideas fail to offer an alternative explanation for those observations, Spergel said. Scott also said that Maeder's hypothesis would likely be unable to explain gravitational lensing — the bending of light in the vicinity of massive objects such as large galaxies and black holes. Observations have shown that the strength of gravitational lensing around some galaxies and clusters cannot be explained without the presence of additional, dark mass. "The fact that the lensing happens at all means that there is some additional mass there, which has to be dark matter," said Scott. Maeder said he plans to continue his research and hopes to provide further observational data to support his model in the near future. The paper was published on Nov. 22 in the Astrophysical Journal.